Tremendous savings in heat loss result equals huge savings in heating costs! Constant temperatures equals very healthy growing environment. & 200% greater insulation value of single paned glazing. & 1300% greater insulation value of single paned glazing. "I put in an electric heater at the far end from the door and it maintains air temperature well. This morning was 15 F and I went out to the greenhouse to water, it was a cozy 73. I got my first electric bill since turning on the heat and did not notice anything dramatically different." "We have a surprisingly well insulated greenhouse. We have had temperatures down to the high 20's and our little Southern Burner does a great job. The propane level has not even dropped & the heater has been running every night for over a month"
"I was very pleased we ordered the insulation. I have purchased a small electric oil filled radiator style heater. It has kept the greenhouse at a constant 45-50 degrees during the night when the temperature has fell into the mid twenties. 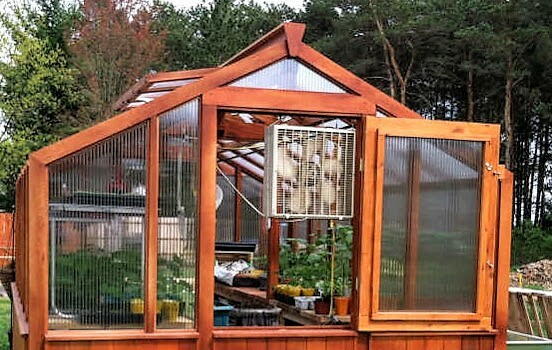 During the day the outside temperature can be in the high 30s and low 40s and the greenhouse temperature will reach the high 50s with the heater turned off and into the mid-60s if the sun is out. 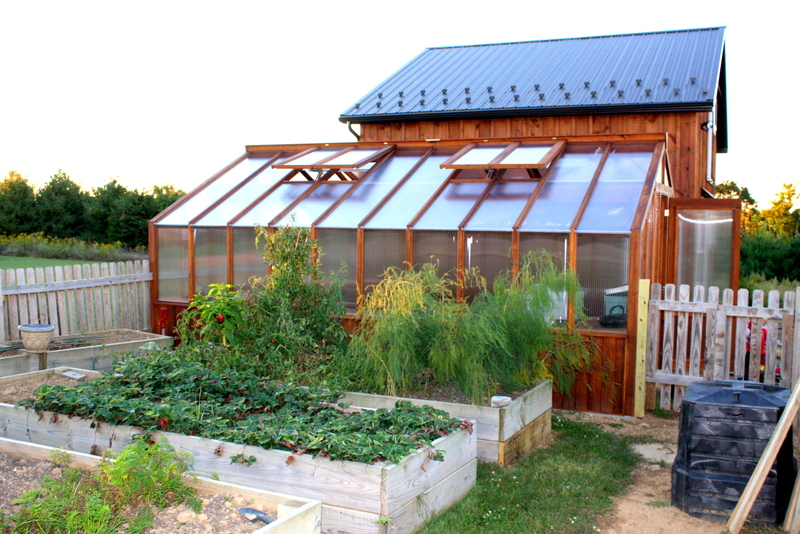 I believe on many warmer days when the sun is shining, we will realize a net solar heat gain (and energy savings) by opening the doors from the interior of our home into the greenhouse-solarium space." Thanks for your excellent product and good service! Contact us for pricing on larger sized GO GREEN kits. This style is available in any size freestanding or lean-to design. 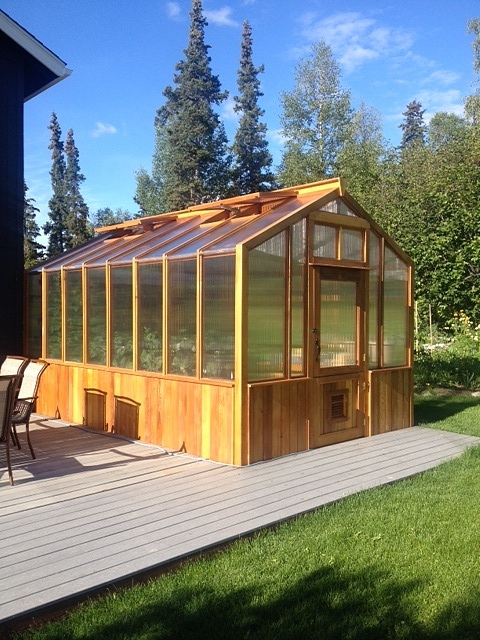 Located in Alaska, this 10x16 GO GREEN has sidewalls ordered 12" higher than our standard 6' high for additional height for indoor gardening. Ordered with interior soil benches for greenhouse gardening, our client tells us that her tomatoe plants grew 24" in one week! She is very thankful for the additional height. Note the additional skylites above the door and the vented Dutch Door. 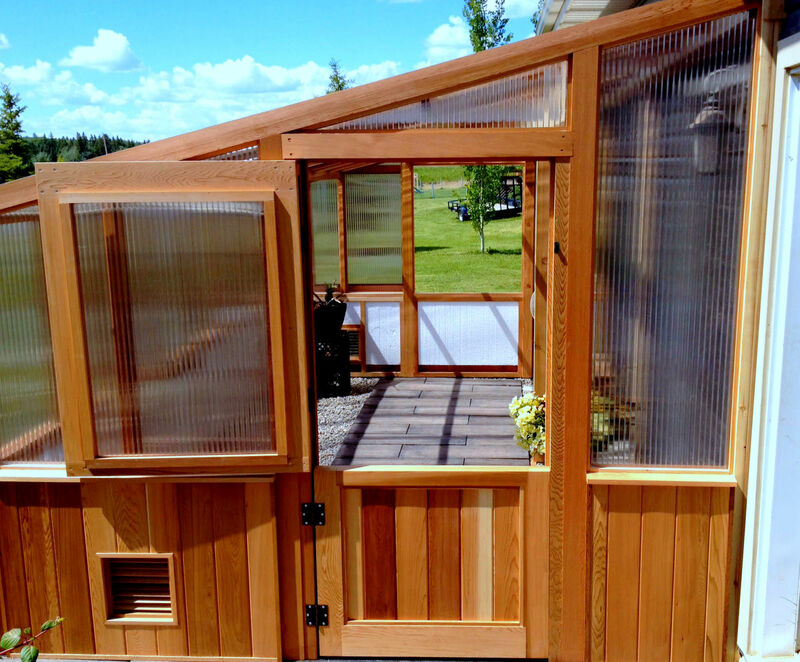 10' x 14' Free-Standing back gable wall with Dutch Window. Pic shows clarity of 16mm triple walled polycarbonate. 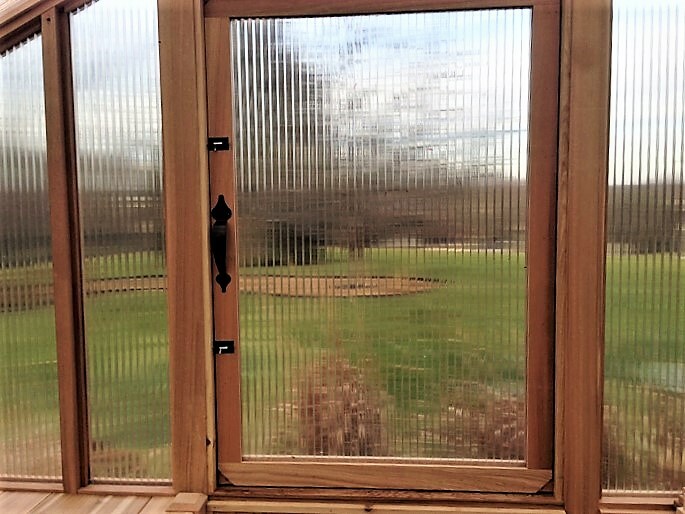 Clarity of 16mm triple walled panels looking out.